Traction aid winches constitute one of the most significant innovations in forest technology over the last ten years. 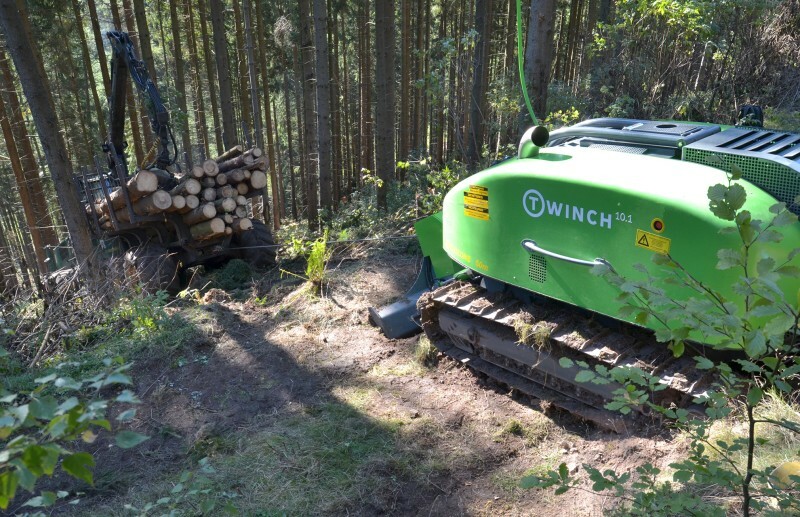 As a valuable tool used for forest work on slopes, they are indispensable for the protection of the soils and in terms of sustainability and under economic aspects. For companies from the German-speaking area, the winches have developed to become a real export hit. Traction aid winches will therefore make a subject of discussion at INTERFORST in Munich from July 18 to 22, 2018, both at the exhibitors’ booths and within the framework of the Special Show of the Board of Trustees for Forestry Work and Technology [Kuratorium für Waldarbeit und Forsttechnik (KWF)]. Traction aid winches have been available since 2004. Initially, they were integrated into forwarders. Shortly afterwards, these first models were followed by versions for harvesters and for the logging of long pieces of timber. The most recently developed winches are put up on the slope separately from the machines. This makes them combinable with the most diverse forestry machines. The technology of these tools will be explained in the course of the KWF Special Show by demonstrating such an autonomous traction aid winch on a KWF-tested system. In the Central European area, these winch systems are primarily intended to reduce wheel slippage and to improve the efficiency of power transmission. In addition, they stabilize the machines also during jib movements on the slope. However, the machines may only be used on slope sites where vehicles can remain standing also without cable support. Besides their suitability for use on slopes, traction aid winches can also help overcome level passageways over soils with a low load-bearing capacity and a high level of humidity without damages caused by slippage. The layout of the cable force is determined by the following factors: total mass of the machine, slope inclination and permissible slippage. Since traction aid winches were first launched onto the market, diverse versions have evolved. The classic integrated model of the traction aid winch consists of a winch integrated into a forwarder. The advantages of this system are its immediate readiness for use, for example. In addition, all protection facilities for the driver can be installed directly by the manufacturer, and the control of all systems is located in one place—complex interactions between several control systems do not have to be taken into account. However, there are also disadvantages. For example, sufficient space for the system must be found in the supported machine. This leads to a reduction of the available load space. In addition, the empty mass of the vehicle increases and its load capacity decreases—ground pressure increases. At the same time, the length of the cable that can be carried along is limited, and disengaging the cable at the exit at the lower end of the aisle is not possible. Some of these points have led to newer developments—the autonomous traction aid winches. Here, the winch stands separately from the supported machine. As a result, installing an additional weight on the machine can be waived. It is possible to wind longer cables than with integrated systems. Disengaging the cable at the lower aisle exit is easily possible. Moreover, several machines can be attached to a traction aid winch, which makes an investment easier and the use of the winch more versatile and flexible. However, this system presents a few disadvantages, too. For example, these are two machines, each of them requiring a separate drive. The winch system requires a location above the skid trail and, if necessary, an anchoring. In addition, there must be a separate control system for the machine—if necessary with sophisticated remote control. This may even require an intervention into the control system of the supported machine. Finally yet importantly, as opposed to the integrated system, the cable becomes a running cable. Therefore, greater attention must be paid to the cable guide. Meanwhile, manufacturers are offering several versions of this model, too. In July, the exhibitors of Interforst 2018 will offer an overview of the state of the art and the current developments in the innovative area of the traction aid winches.